At one point in time, the use of robotics to perform delicate tasks that are usually carried out by trained humans seemed like science fiction. This, in the age the internet, eCommerce sites where you can buy cameras (and a huge selection of items), and price comparison sites like uPrice, is no longer the case. Robotics is instead seen nowadays as an enabling tool that allows for extreme accuracy in a wide variety of applications. 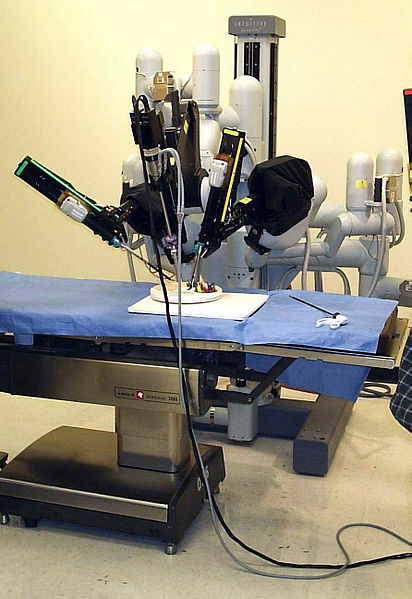 In the medical environment, the employment of robotics has gained widespread acceptance as an aide to surgeons who see the precision and minimal invasiveness of robot-assisted surgery as a leap forward for the health profession. Laparoscopic surgery makes use of truly cutting edge technology to perform procedures where purely human intervention would lead to larger incisions. In addition to this minimisation of invasive actions, robotic technology eliminates errors that could be caused by hand tremors. The robotic arms used in robotics-assisted surgery can execute extremely precise movements which is often required in fastidious surgical procedures. Whereas human hand movement is limited on several planes, the engineered joints of robotics designed specifically for surgery can move freely in up to seven directions. In practice, this means that angles of incision need not be limited by the ergonomic limitations of the surgeon performing the operation. High Definition video imaging is also, in many ways, an improvement on the human eye. This is to say that the ability of the unaided human eye to focus in on minute areas of the human body is severely constrained. High definition optics, on the other hand, can give the surgeon unprecedented accuracy and clarity in observing his subject. The case for robotics and technology aided surgery is very strong as the cumulative advantages gained by surgeons would result in many less errors in the operating theatre. In addition to this, surgeries that are generally considered as being too risky would enjoy a much higher incidence of occurrence and success. The rapid development of surgical robotics has led to the phenomenon of telesurgery; the phenomenon is very much more complicated than simply using your BlackBerry 10 to perform a remote procedure. Telesurgery is more often than not referred to as remote surgery, and describes a surgery that is performed on a patient from a distance. Telecommunications technology has dramatically increased data transfer rates across communications networks, meaning that even at great distances, the rapport between a surgeon and the operating theatre is almost immediate. Live video streaming is relayed to the surgeon (along with other information concerning vital stats), and the surgeon in turn relays commands to the robotic machinery operating on the patient. To prevent adverse effects from occurring in the case of an emergency, however, a surgeon is always present in the operating room when the remote surgery is being performed. The most well publicised remote surgery to date is popularly referred to as the Lindbergh Operation. The surgery was performed on the 7th of September 2001 across the northern section of the Atlantic Ocean. It is named after the first pilot (Charles Lindbergh) to complete a transatlantic flight. Dr Jacques Marescaux, who at the time was in New York City, performed a cholecystectomy on a 68 year old female patient in Strasbourg, France. The distance between the patient and doctor was in excess of 6200km. The data for the operation was transferred over a dedicated fibre-optic cable to ensure that there was no lag and no break in transmission. Since Operation Lindbergh, numerous other remote surgeries have been performed over long distances. Many of these have been done over normal high speed internet links.